This year, the 13th session of HUPO was held in the beautiful city of Madrid. We had such lovely warm weather compared to Paris or Newcastle Upon Tyne, with temperatures 10°C higher in Madrid. Sadly, with all the activity going on at the conference, there wasn’t much time to enjoy the sun. I could however enjoy the long evenings, eating at the very (very!) late Spanish time and having a walk around the old city, visiting the famous Placa de Majorque. I even had the chance to see some students singing serenades as a traditional tuna. The week kicked off for Nonlinear with a pre-conference course on Progenesis, organised by the congress. It was a great success, with a lot of interest and, since it was fully booked, we had to run an extra session! This year, we had a joint booth for Waters and Nonlinear which was perfect to show off the latest MS instruments from Waters with ion mobility, and the newest version 2.0 of Progenesis QI for proteomics which is fully compatible with this additional dimension in resolution. 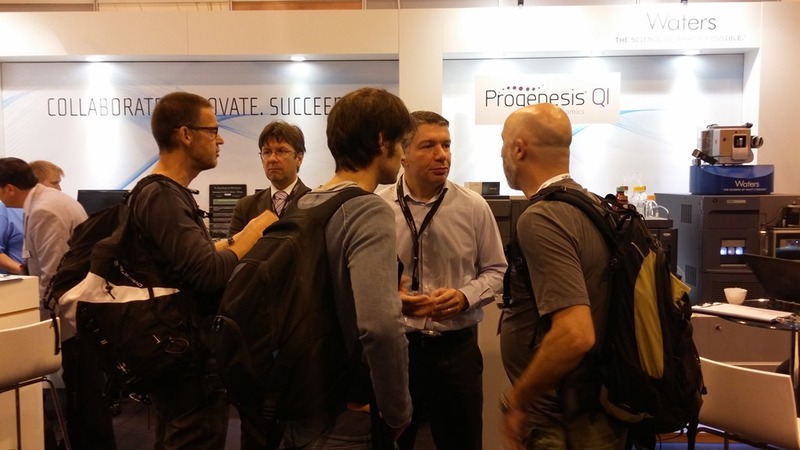 Waters gave a lunch seminar on Monday where we showed the latest developments in Progenesis QI for proteomics in more detail; the QC Metrics along with the automation of the workflow were highly appreciated. There are now many QC metrics tools in Progenesis, aimed at both process optimisation and validation of the input data. If you wish to know more, just contact us and we will arrange a demonstration for you! Or you can simply download it and have a try at your convenience! Next year, the 14th HUPO congress will be held in Vancouver – we hope to see you there to show off even more new features. This entry was written by Agnès Corbin, posted on October 20, 2014 at 12:36 pm, filed under October 2014 and tagged Conferences, Progenesis QI for proteomics. Bookmark the permalink. Follow any comments here with the RSS feed for this post. Post a comment or leave a trackback: Trackback URL.